Sir Christopher Michael Wren (20 October 1632 – 25 February 1723) is one of the most highly acclaimed English architects in history. Other notable buildings by Wren include the Royal Naval College, Greenwich, and the south front of Hampton Court Palace. The Wren Building, the main building at the College of William and Mary, is attributed to Wren. It is the oldest academic building in continuous use in the United States. 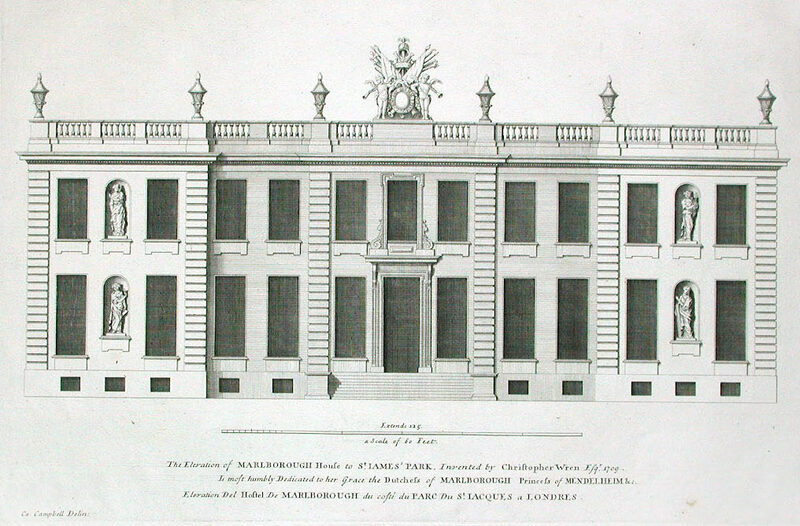 In Wren’s age, the profession of architect as understood today did not exist. Since the early years of the 17th century it was not unusual for the well-educated gentleman, (virtuosi), to take up architecture as a gentlemanly activity; a pursuit widely accepted as a branch of applied mathematics. This is implicit in the writings of Vitruvius and explicit in such 16th century authors as John Dee and Leonard Digges. 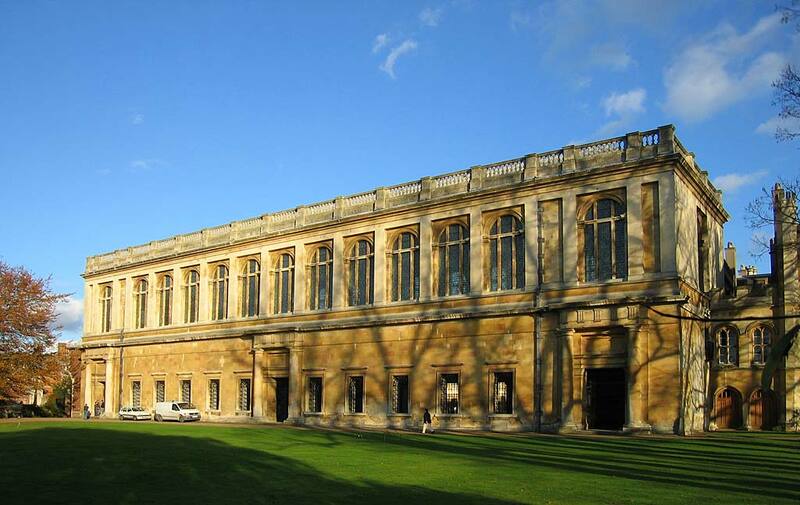 When Wren was a student at Oxford, he became familiar with Vitruvius’s De architectura and absorbed intuitively the fundamentals of the architectural design there. In English Medieval tradition, buildings were constructed to the needs of the patron and the suggestions of building professionals, such as master carpenters or master bricklayers. Educated in Latin and Aristotelian physics at the University of Oxford, Wren was a notable anatomist, astronomer, geometer, and mathematician-physicist, as well as an architect. He was a founder of the Royal Society (president 1680–82), and his scientific work was highly regarded by Isaac Newton and Blaise Pascal. 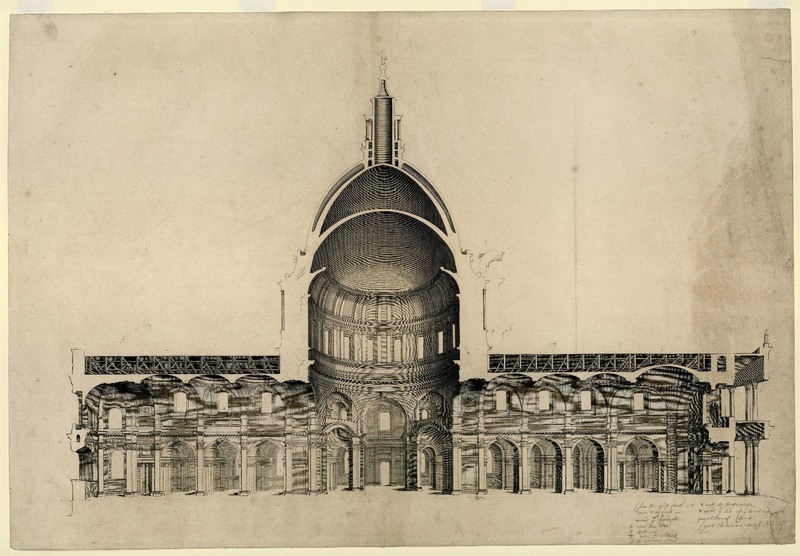 Saint Paul’s Cathedral, London – plan and section. 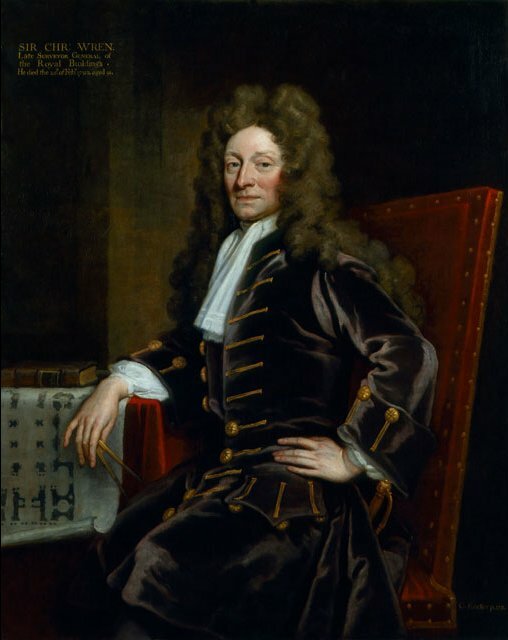 Christopher Wren, (1675-1709). Wren wrestled with the design of the famous St Paul’s dome even as it was being built, remodeling its profile countless times. In the 20th century the potency of the influence of Wren’s work on English architecture was reduced. The last major architect who admitted to being dependent on him was Sir Edwin Lutyens, who died in 1944. With the purposeful elimination of historic influences from international architecture in the early 20th century, Wren’s work gradually stopped being perceived as a mine of examples applicable to contemporary design. 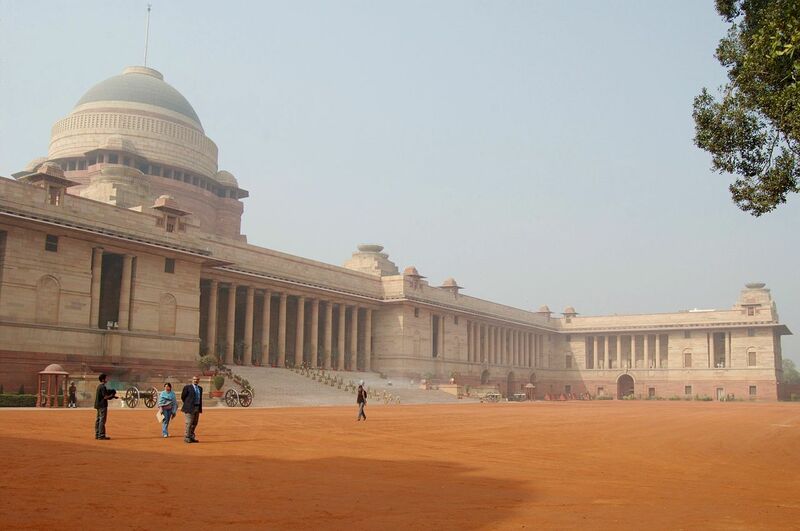 Rashtrapati Bhavan (formerly known as Viceroy’s House) is the official home of the President of India, located in New Delhi, Delhi, India. It was designed by Lutyens. Lutyens said the design evolved from that of the Pantheon in Rome, while it is also possible that it was modeled partly after the great Stupa at Sanchi, or St. Paul’s dome.